可以看到，把图中第一步出现的所有单词原封不动的代入了中文的叙述中，这是因为，流程图中出现的有关材料、部件的名词不需要，也不能被替换。所以只要用最简单的语言叙述流程就可以啦。那么对应的英文叙述应该是这样的：In the first step, the limestone and clay will be crushed into powder. The given flow chart reveals the progress of cement producing and its using in concrete production for constructing aims. In the first given flow chart, we can see that the limestone and clay are crushed together so that powder can be output. After that, the powder will be transported into a mixer, followed by a rotating heater where the powder can be further mixed and heated at a certain degree. At such degree, the powder will be softened and can be easily selected by grinder. The final stage is to pack the produced cement into bags for further destination. 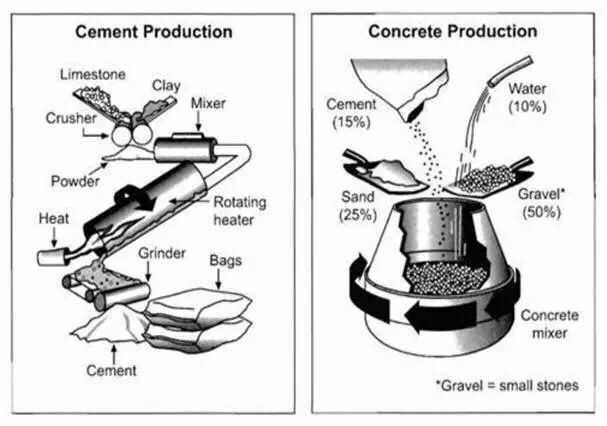 The second chart demonstrates the concrete production process. Precisely, the ingredient is consisted by 15% of cement, 25% of sand, 10% of water and 50% of gravel (also known as small stones). All of above materials will be poured into a huge rotating mixer. And after long time rotating and mixing process, the concrete will be produced. GMT+8, 2019-4-25 22:44 , Processed in 0.118208 second(s), 30 queries .